What's the Value of Advertising in Western New York Physician? Western New York Physician is a 4-color, glossy magazine — created specifically for, and mailed directly to every physician, practice manager and healthcare leader in the region. Each issue highlights the latest innovations in diagnosis, treatment and patient care and includes practical insight from regional experts on the business of medicine —risk management, insurance issues, legal perspective, finance and practice management. 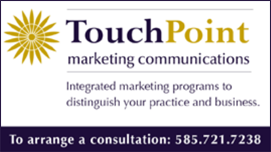 An advertising presence in Western New York Physician keeps your practice - your business - your product on the top of reader's minds. To request an advertising rate card, click one of the links below. Target: All licensed physicians, practice administrators and health care leaders in the Western NY region.